At the outbreak of the First World War in 1914, the British government realized that it had to keep the Suez Canal open at all costs because it was the primary sea route connecting Britain to its far-flung eastern colonies. The Suez bordered Egypt, a nominal Turkish province, and, when Turkey became involved in the war on Germany's side in 1915, Turkey attacked the canal. As a result the British declared war on Turkey and began an offensive against the Ottoman forces and their German advisers. The British, aided by various Arab groups, swept north through Palestine, Jordan, and Syria to Turkey's ultimate defeat in October 1918. In Armageddon, 1918, eminent military historian Cyril Falls discusses the background of the World War I Middle East conflict and relates the final, critical campaign through Palestine, along with its notable personalities, including T. E. Lawrence, Emir Feisal, Kress von Kressenstein, and Edmund Allenby. 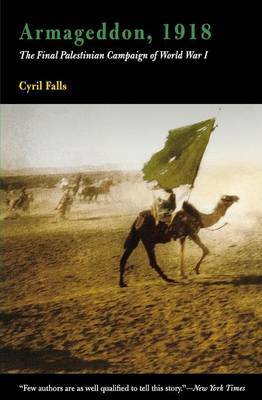 Falls ends with a pertinent reflection on the subsequent history of the region, from the formation of Iraq in 1920 through the establishment of Israel, showing how the campaign in the Middle East brought into the international spotlight the tangled alliances and imperialistic and nationalistic desires that have left an indelible mark on the region to this day.